Use the section of additional statistics graphs located on the right of the detailed statistics page to analyze the audience's activity, how much time is spent reading a message, and other related data. Click on the necessary section in the block to view the graph. Average percentage of the message viewed shows which part of the message users read. 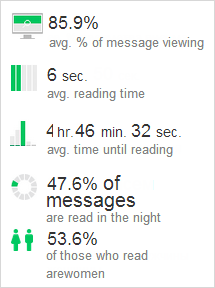 Average time spent reading a message shows how much time is spent reading the message. Average time until reading shows how much time passes from when the message is received until it is read. Audience activity shows what time of day users most often read your messages. Audience interests shows the audience's gender, age, income, and affinity index. A value close to 100% indicates that your target audience's interest in the topic does not differ from the average for other mailings. If the affinity index significantly exceeds 100%, you can be certain that subject corresponds to your audience's interests. For example, an index of 200% for a mailing about cars (auto) means that recipients of this mailing are twice as interested in auto-related subjects than all recipients of online mailings as a whole, and this mailing will be relevant for them.